Bob Richard was introduced to woodworking and furniture making while studying Industrial Arts Education at Fitchburg State University. Upon graduation in 1970, he began to teach woodworking at Grafton Sr. High School in Grafton Mass. This association lasted over 14 years and provided valuable hands on experience with a variety of materials and techniques. “There was always an underlying theme of extremely high quality and longevity in the work we did.” During his tenure at Grafton Bob spent 2 years studying furniture design and building at the Worcester Crafts Center under the guidance of Rhodes Scholar Tony LaRocco. Tony was a Master Craftsman previously at Sturbridge Village in Sturbridge Massachusetts. 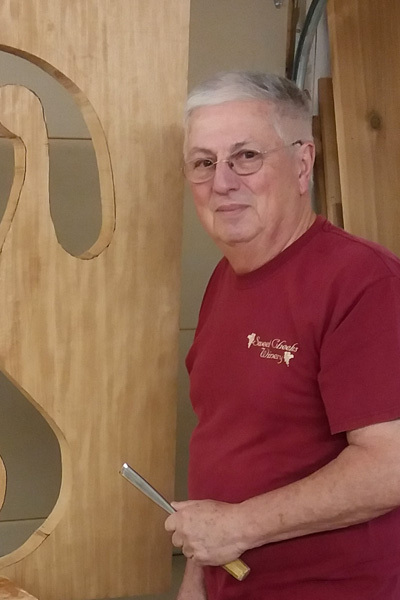 The two-year program in furniture and cabinetry gave Bob the added skills to create high quality furniture using traditional, time tested methods. He is fascinated with lesser known historic styles of furniture and the circumstances and influences that make them so unique. h in the human figure and abstract designs. His passion over the years for this type of art has grown immensely and hopes that it brings the same joy to his audience as it does to him. His love of nature and the beauty nature creates in the woods are a major driving force in what he does. He sees nature as the creator of beauty and he views himself obligated to bring that beauty to the forefront of his work. Bob has sold work throughout the United States, Canada, and several countries in Europe which include France, Italy, Germany and the United Kingdom. Bob’s work is also displayed in the Gallery Officiel Montratre Paris France. His work, which is placed at the Staghorn Grotto, is names “The Wave” and is African Mahogany, stainless steel and white marble, and was donated to the Gardens by the sculptor.